(NYTimes) - We are in a month of celebrations, which means that extra resources are channeled into the kitchen. Those of us who don't normally spend time discussing recipes, menus and table settings are busy making sure that they don't fail the good-host test. Cooking aficionados are also upping their games, hoping to prove that theirs is the clearest broth, the tenderest turkey, the smoothest mash. Like it or not, these are the meals we all remember. For professionals, particularly in the cake department, the effort is taken to a different level. I witnessed this in Paris a couple of years ago, when I was assigned to write a magazine piece about the state of French pâtisserie (yes, eating cakes was something I was actually paid to do, I am embarrassed to disclose). It was November when I visited, and all my interviewees were eager to share their innovations for that year's bûche de Noël, or Yule log. In the months leading up to Christmas, the top pastry chefs focus their efforts on this one traditional cake. Complex structures are erected in which, for example, lemon curd gently rubs shoulders with a red-fruit mousse nestled on a spiced sponge, the entire glorious creation coated with a mirrorlike glaze. The level of ingenuity is mind-boggling but flavour is still at the heart of the project. I love the competitive and highly creative nature of the endeavor, and the fact that it leads to creations that people can actually eat. This is the spirit behind my own bûche de Noël. It includes a classic flavour combination I always go back to this time of year, that of dates and oranges (or in this case, kumquats or tangerines). There are some technical challenges along the way: making your own caramel shards, piping and torching your meringue, and even just taking care to avoid overbaking your sponge. The reward is unrivaled, though. 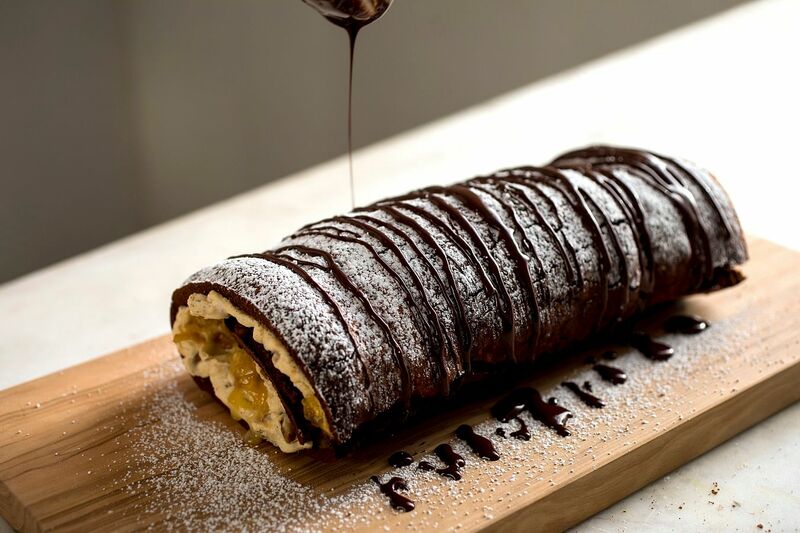 Bringing this Yule log to your holiday table will create that ta-da, heart-stopping moment for you. For just a second, you will actually become one of those accomplished Parisian pâtissiers. 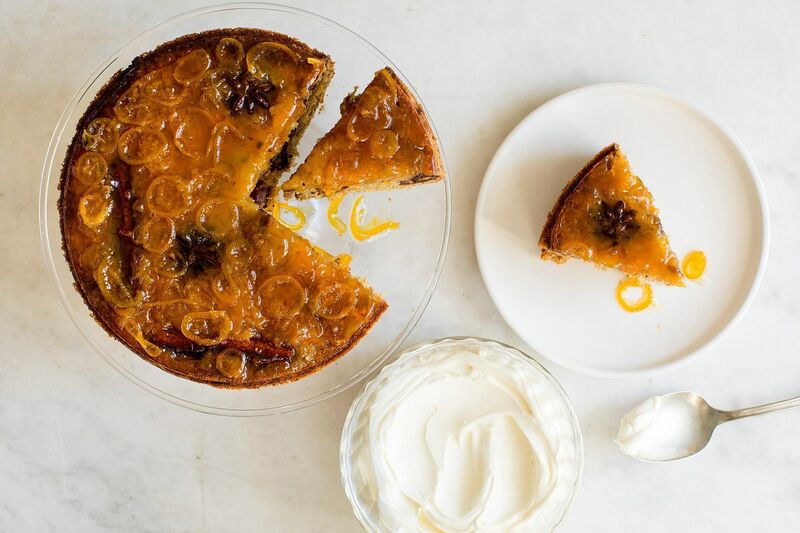 The slightly less ambitious upside-down cake here may not be quite the stuff of French daydreams but, I can assure you, will also leave behind some seriously sweet holiday memories. 1. Prepare the marmalade: Trim and discard the ends of the kumquats, slice the kumquats into 3mm rounds and discard the seeds. If using tangerines, quarter them lengthwise then cut them into 3mm-thick slices. Transfer the fruit, star anise, cinnamon, vanilla and 2 cups (450ml) water to a large saucepan. Bring to a boil over medium-high heat and cook until the fruit has softened, about 10 minutes. 3. Remove from the heat and stir in the orange juice and cognac. Let cool at least 1 hour. Discard the star anise and cinnamon sticks. 4. Prepare the cake: Heat oven to 170 deg C. Grease the base and sides of a 9-by-13-inch (23-by 33cm) jellyroll pan with butter. Line the base with parchment paper, grease the paper and set aside. 5. Melt 2½ Tbs (35g) butter and 35g of chocolate in a large heatproof bowl set over a medium saucepan of simmering water over medium-low heat, stirring frequently, until melted, 2 to 3 minutes, then set aside to cool. Sift the flour, coffee powder, salt, baking powder, baking soda and ¼ cup (20g) cocoa powder into a medium bowl and set aside. 6. Place the eggs, yolks, brown sugar and zest in the bowl of a stand mixer. Using the whisk attachment, whisk the mixture on high speed until thick, pale and tripled in volume, about 2 minutes. Reduce the speed to medium-low, add the melted chocolate mixture, and mix until combined, about 30 seconds. 7. Using a spatula, gently fold in the flour mixture. Pour the mixture into the prepared pan and smooth it into an even layer. Bake until the cake has just set and springs back slightly to the touch, 6 to 8 minutes. (The cake will continue to cook as it cools, so resist the urge to overbake.) Let cool for 5 minutes. 8. Sift 1 ½ tsp cocoa powder over the top of the cake, then cover with a clean tea towel. Place a wire rack on top of the towel and quickly flip the cake over, removing the pan and paper. Sift the remaining 1 ½ tsp cocoa powder over the top of the cake. With one of the shorter ends facing you, roll the still-warm cake lengthwise into a roulade, with the towel inside, and let cool completely. 9. Prepare the caramel shards: Line a small baking sheet with parchment paper. Add the sugar and 1 tablespoon water to a small saucepan. Cook over medium-high heat, gently swirling the pan until the sugar melts and the caramel turns a medium amber color, about 5 minutes. Immediately pour the caramel onto the prepared sheet and spread it out as thinly as possible using an offset spatula. Let cool until firm. 11. Prepare the meringue topping: If necessary, reheat the oven to 170 deg C. Add the sugar to a small baking pan lined with parchment paper and warm in the oven, 8 minutes. Meanwhile, place the egg whites in the bowl of a stand mixer. When the sugar is 1 minute away from being done, using the whisk attachment, whisk the eggs whites on medium-high speed until frothy. 12. Turn the mixer off and carefully add the hot sugar, using the parchment paper as a funnel. Increase the speed to high and whisk the meringue until stiff peaks form and the mixture is no longer grainy, about 3 minutes, scraping down the sides of the mixing bowl as necessary. Spoon ½ cup (70g) into a piping bag and set aside. 13. Assemble the roulade: Gently unroll the cake but keep it on the tea towel. Using an offset spatula (or a regular spatula if you don't have one), spread the date-and-orange cream evenly over the top of the cake, leaving a 1-inch border at the short end farthest away from you. Distribute ½ cup (125g) marmalade over the top of the cream by small spoonfuls and gently spread it out using the back of the spoon. 14. Starting with the short end closest to you, carefully roll the sponge into a roulade, using the cloth to help you. Dust the top of the cake lightly with powdered sugar and carefully transfer the roulade, seam side down, to a serving plate. 15. Melt the remaining 35g of chocolate over a double boiler set over low heat, then drizzle the roulade with the melted chocolate and leave to set slightly, about 5 minutes. 16. Snip the end off the piping bag and pipe 1-inch-tall (2.5cm tall) decorative spikes along the top of the roulade. (Pipe the remaining meringue mixture into small kisses and bake separately, if you wish.) Use a blowtorch to burn the meringue so it is scorched in spots. At this point you can refrigerate the roulade for a few hours, until ready to serve. 17. To serve, break the caramel into 2-inch (5cm) shards and stick them haphazardly into the meringue topping. Using a small fork, pick out pieces of citrus from the remaining marmalade and distribute them in between the shards. Use the chocolate shavings to fill any gaps in your decorations and serve. 1. Prepare the marmalade: Trim and discard the ends of the kumquats, slice the kumquats into ⅛-inch (3mm) rounds and discard the seeds. If using tangerines, quarter them lengthwise then cut them into ⅛-inch-thick (3mm) slices. Transfer the fruit and the star anise, cinnamon, vanilla and 2 cups (450ml) water to a large saucepan. Bring to a boil over medium-high heat and cook until the fruit has softened, about 10 minutes. 4. Prepare the cake: Heat oven to 170 deg C. Butter the bottom and sides of an 8-inch (20cm) springform cake pan and line the bottom and sides with parchment paper. Measure out ¼ cup marmalade and set aside. Spoon 1 cup (250g) of marmalade into the pan, leaving a ¾-inch (1.9cm) border around the edges. 5. Sift together the flour, almond flour, baking powder, ground star anise and salt and set aside. Place the 3/4 cup (170g) butter and the Demerara sugar in the bowl of a stand mixer. Using the paddle attachment, mix on medium speed until light and fluffy, about 3 minutes. 6. Reduce the speed to medium-low and add the eggs one by one, scraping down the bowl as needed, until combined, about 2 minutes. Add the dates and mix for 30 seconds on medium speed. On low speed, add the flour mixture, followed by the milk and mix until well combined, about 30 seconds more. 7. Spoon the batter into the prepared pan, starting around the perimeter of the pan to keep the marmalade in place, then smooth the surface into an even layer. Transfer the pan onto a baking sheet. Bake until the cake springs back to a light touch in the center or a skewer inserted into the center of the cake comes out clean, 60 to 75 minutes, rotating the cake halfway through baking. Let cool for 5 to 10 minutes. 8. 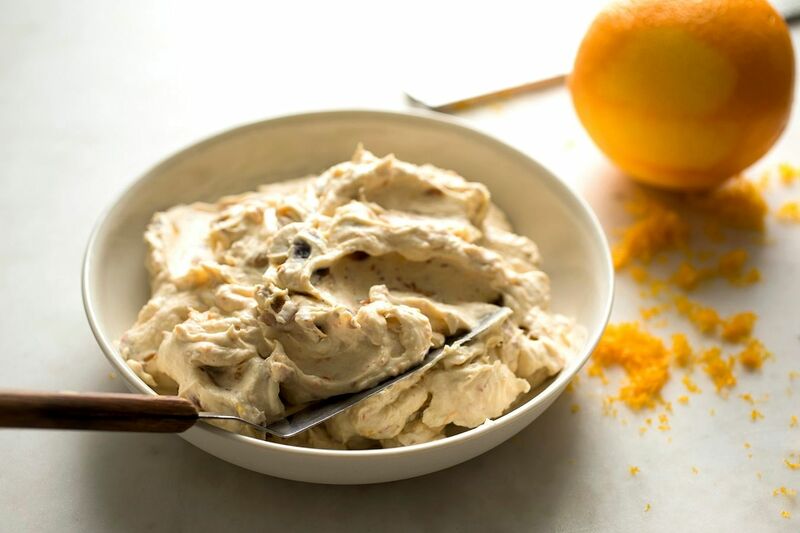 Prepare the cognac mascarpone: Combine all the ingredients in the bowl of a stand mixer. Using the whisk attachment, whisk on medium-high speed until smooth and thickened, about 2 minutes. 9. Carefully release the sides of the cake pan and invert a serving plate over the top of the pan. Flip the whole thing over and carefully remove the paper. 10. Gently warm the reserved ¼ cup marmalade and spoon evenly over the top of the cake. Slice with a sharp knife and serve warm, with the cognac mascarpone alongside.